In the 4th round the Russian Ernesto Inarkiev had Black against Vassily Ivanchuk. Ernesto won a nice game and joined the leading group – six players of the tournament scored 2,5 points in the first four games. All other games of the round were drawn. Ivanchuk obtained a big advantage in the Caro-Kann Defense. The game quickly proceeded to an endgame, where the Ukrainian needed to make a few accurate moves to secure a win. However, Ivanchuk lost the thread. He conceded the initiative to the opponent, and soon initiated an unsuccessful rook maneuver, allowing Black to promote his passed pawn. Ruslan Ponomariov didn’t equalize against Peter Leko in the Berlin Variation of the Ruy Lopez. Leko exchanged his central pawn, simplified the game and obtained a stable advantage in the ending. 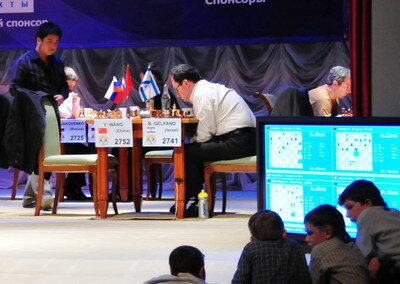 However, the Hungarian did not play the rest of the game perfectly, while Ponomariov showed excellent defensive technique. The Ukrainian eventually activated all his pieces and equalized the game. Vladimir Akopian misplayed the Ruy Lopez as White, and soon Shakhriyar Mamedyarov already had a better position thanks to the bishop pair and more active pieces. However, Mamedyarov failed to find the best moves, and allowed White to create two dangerous queenside passed pawns. After the series of exchanges the game advanced to a drawish rook ending. Peter Svidler did not pose any problems in the English Opening against Teimour Radjabov. Black seized the initiative around the 20th move, but it seems the Azeri player did not find ways of developing his game and soon forced a draw by repetition. Pavel Eljanov played a bit too ambitiously against Vugar Gashimov’s Benoni, and allowed the opponent to gain the initiative. The Ukrainian had to sacrifice a piece for two pawns in order to neutralize Black’s activity. In the resulting ending Gashimov was unable to break the opponent’s defense. A draw was agreed on the 60th move with almost all the pieces being exchanged. Two Russians, Dmitry Jakovenko and Evgeny Alekseev, started the game as a Queen’s Indian, and transposed it to a Benoni. It is possible that Jakovenko was not prepared to such development of events, as on the 28th move he didn’t dare to play sharp and preferred to accept the move repetition. Boris Gelfand had a good chance to win another game in this round. Wang Yue sacrificed a pawn in the Schlechter Variation of the Slav Defense, but did not obtain sufficient compensation for it. In the endgame Black tried to compensate material deficit by the activity of his rook, and he succeeded to make a draw after White made a couple of inaccurate moves.